Obituary edited from the Daily Telegraph on 1st May 2018. John Carruthers who has died in Sabah aged 84, was ADC to the last British governor of Singapore and later a doyen of the British community in Malaysia, where for many years he represented Barclays Bank. 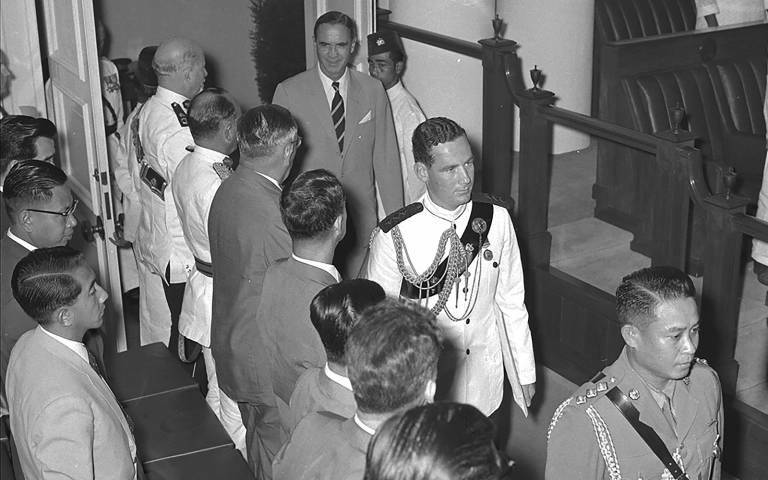 It was Sir William Goode, as governor from 1957 to 1959, who steered Singapore through political turbulence to self-government, statehood and the swearing in as prime minister of the youthful firebrand Lee Kuan Yew – who in turn asked Goode to serve briefly as Singapore’s first head of state. At Goode’s side on all major public occasions and in sensitive negotiations during the crucial 18-month period was Captain John Carruthers of 2/2 Gurkha Rifles. Goode described Carruthers as “outstandingly competent, shrewd and reliable … with the happy knack of being able to take command of an unexpected situation”. Among other delicate assignments, the ADC had overseen with “no semblance of fuss” a visit by the Duke of Edinburgh; Carruthers’s own recollection of the famously brisk royal visitor was that he was “the fastest dresser I’ve ever seen”. Another memorable guest was the Australian prime minister Robert Menzies. Carruthers sat in on a meeting in which Lee revealed plans to erase a colonial landmark by building over Singapore’s Padang cricket pitch, facing City Hall; waxing imaginatively about their nations’ shared cricketing heritage, Menzies achieved the rare feat of persuading Lee to change his mind. John Lawson Carruthers was born at Alexandria on January 21 1934. His Carruthers ancestry was Scottish, but both parent families were part of the British mercantile community of the Levant. John’s paternal grandfather, Walter, and father, Hugh, were managers of the Anglo-Egyptian Bank, which became part of Barclays in 1925; Hugh was later local director for Barclays in Egypt and president of Alexandria’s cotton bourse. John’s mother Yolande, née Lawson, descended from several generations of cotton merchants at Smyrna in Turkey. After an eventful wartime childhood in Alexandria, John was dispatched in 1945 to Rottingdean prep school and then to Rugby, where he captained the 2nd XV. An interlude in France preceded Sandhurst and a commission in the 2nd King Edward VII’s Own Goorkha Rifles (The Sirmoor Rifles) in 1954. Having joined the regiment on the same day as a future field marshal, (Sir) John Chapple, and a future chief of the Cresta Run, Digby Willoughby, Carruthers served with its 2nd Btn in Hong Kong and Malaya before his ADC role in Singapore. Afterwards, promoted major, he was adjutant of a training depot in the northern Malay state of Kedah. In 1966, during the “Confrontation” between Indonesia and Malaysia, he commanded a company at Nanga Gaat, a forward base in the Sarawak jungle close to the Indonesian border. Next came a staff job at GHQ Singapore and a posting in Brunei. But by the end of the decade defence cuts were forcing a reduction of Gurkha battalions from eight to four, and Carruthers was one many officers who chose to leave. In 1970 he joined Barclays, and after training in the West Indies and Singapore, he settled in Kuala Lumpur in 1977. There his duties ranged from arranging high-level meetings for visiting directors to pursuing late payers of credit card accounts. He was no technical banker, but his charm, discretion and sharp ear for political and business gossip gained him a reputation as a model representative. 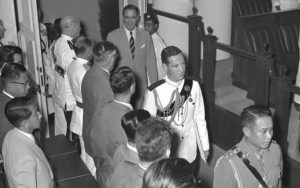 In an era when Malaysian officialdom often resented any British presence, Carruthers was universally well received – even by the martinet central bank governor, Tun Ismail Ali. For some years, Carruthers’s territory also included Vietnam and Burma – whence he would return from “correspondent banking” visits with brown-paper parcels of dark cheroots, to be enjoyed with dinner guests on his veranda in the wooded suburb of Kenny Hill, serenaded by the night chorus of tropical insects. In 1996 he moved to the Malaysian island of Labuan, off Brunei, to open a Barclays office in the “offshore financial centre” there. He retired in 1999 but happily made the island his permanent home and became the “grand old man” of its small expatriate community. In his seventies he took up sailing – and astonished friends by embarking on seriously intrepid voyages from Labuan around the southern Philippines archipelago, where westerners rarely venture, and as far afield as Australia. He was also a keen golfer and a devoted attendee, on visits to England, of regimental reunions. In his last years of fading health he was well cared for at Kota Kinabalu in Sabah. John Carruthers married first, in Singapore in 1960, Judith Armstrong, who came from Bridgetown in Western Australia; they had a son and two daughters. The marriage was dissolved in 1978 and he married secondly, in Kuala Lumpur in 1983, Rukiah binti Mohd Noor, with whom he had a son and from whom he was divorced in 2003. His four children survive him; his ashes were scattered in the South China Sea.